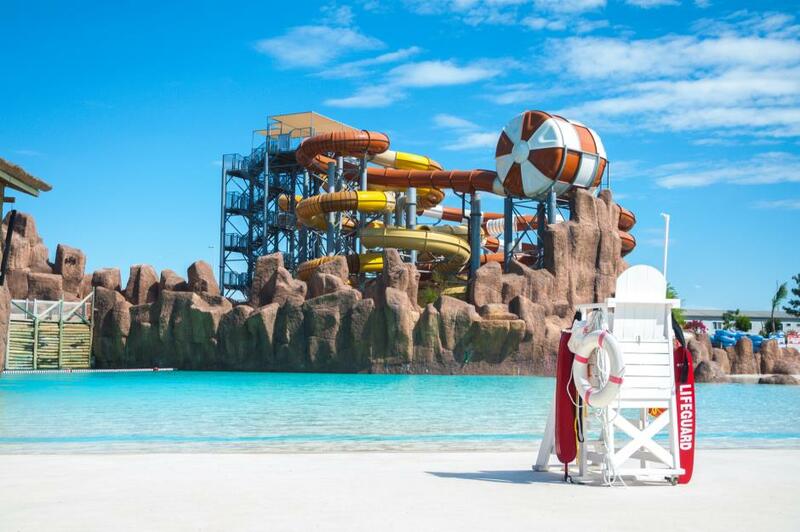 From meandering around lazy rivers, lapping up the waves or plummeting down vertical drops, there are plenty of thrills to be found in water parks. We find some of world's wettest and wildest attractions. 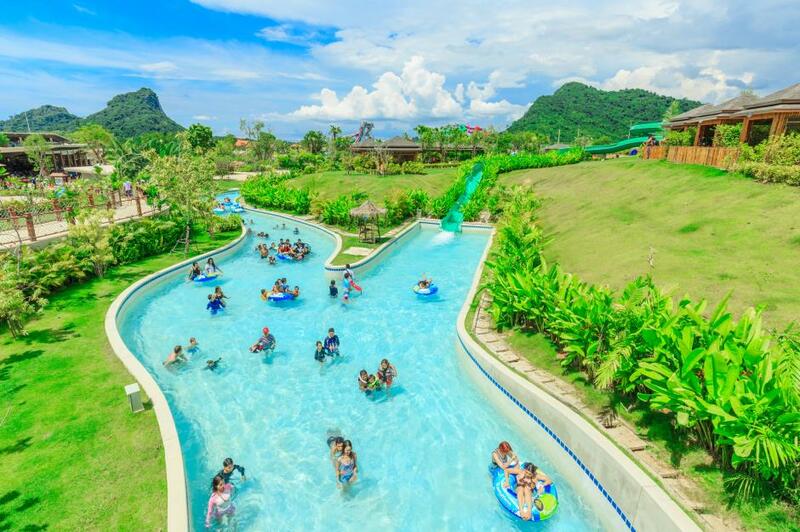 The Thailand-themed attraction in Tenerife has been named the world's best water park by Tripadvisor for the last four years in a trot. And for good reason. Top attractions are the Tower of Power where riders can reach speeds of around 50 miles per hour as they swoop down the 90-foot-high slide into an aquarium filled with stingrays and sharks. Tackle the Mekong Rapids on a giant inflatable with your mates or dare them to take on the Dragon, a totally vertical funnel. Recover on Siam Beach. 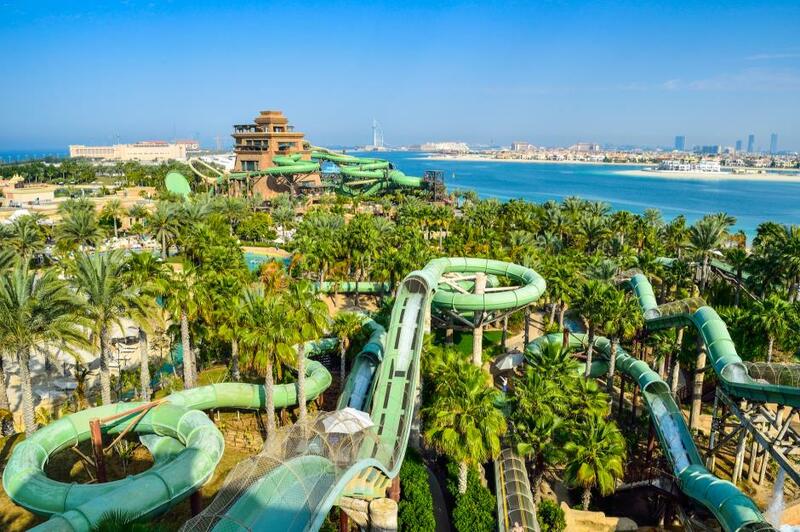 It takes 45 minutes to ride the lazy river around the Middle East's largest water park Aquaventure, part of Atlantis, The Palm. The giant river connects the park's two main water slides – the Tower of Poseidon and Tower of Neptune. Up the ante on the Rapids where tube riders are propelled through high-intensity rapids, wave surges and waterfalls. The lovely tropical setting also includes a white-sand beach, perfect for flopping on. 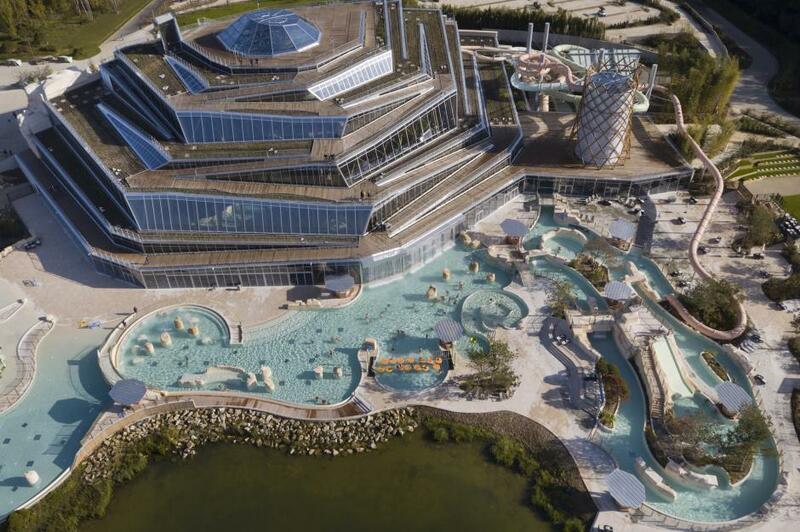 Part of the impressive Villages Nature Paris eco-resort near Disneyland, this water park is heated entirely by geothermal energy and more than a third of its water purified naturally. Throw yourself down one of the eight giant slides, catch the surf in the wave pool or wallow in the lovely outdoor lagoons, which are heated to 30°C all year round. There's also an aquatic climbing wall, white-water rivers, geysers and a lovely spa. 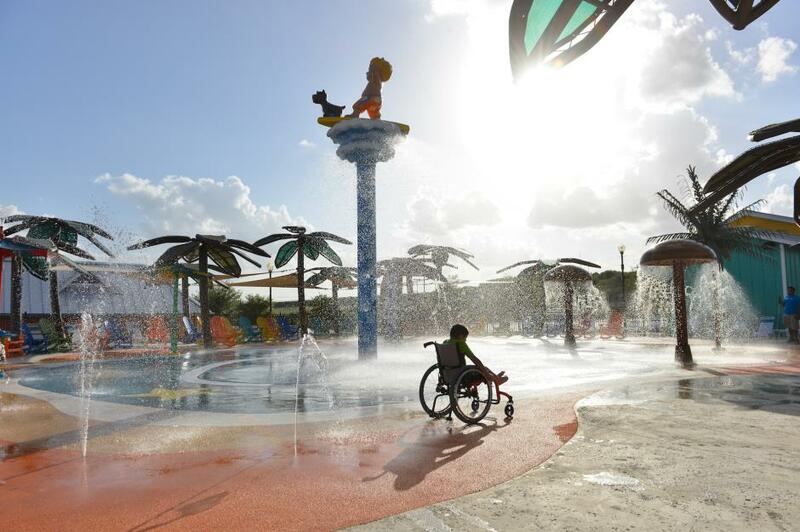 The world's first ultra-accessible splash park opened in San Antonio, Texas, last year. While every part of the pioneering park is wheelchair accessible that doesn't mean it's tame: the River Boat Adventure ride twists and turns through jungle and five water play areas feature waterfalls, pools, geysers, jets, water cannons and tipping buckets. There are waterproof wheelchairs available and special wristbands allow parents or carers to easily locate their party. 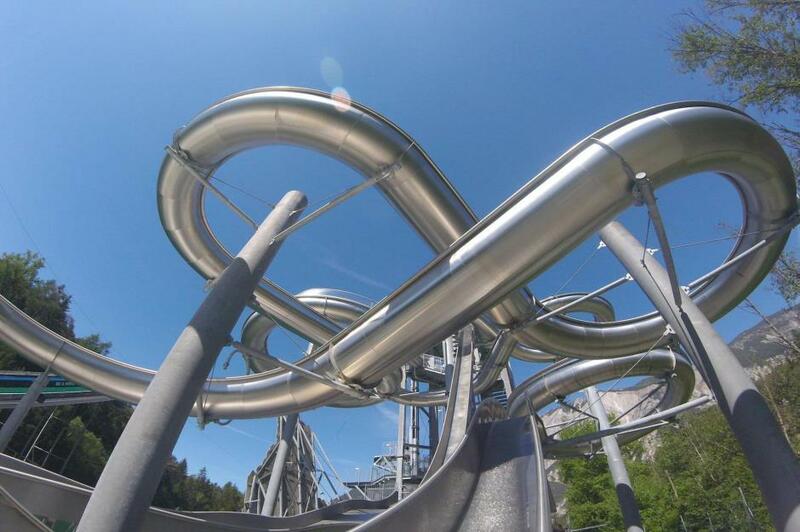 This excellent outdoor playground in the Ötztal valley in the Tirol promises plenty of thrills and spills. Based around a lake, water-centric attractions include the Cannonball where you'll be blasted into the lake from a seat with a huge water jet. You can also whiz down the waterslides, go "cliff diving" from an incredibly high diving board or try your hand at "blobbing" – basically throwing yourself onto an inflatable blob from a tower. 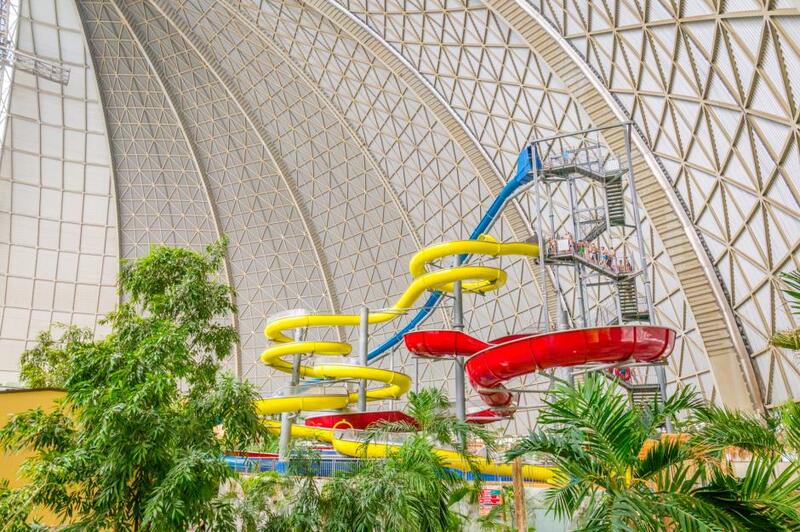 Lazy rivers, wave pools, tube slides, raft rides, wet play areas for the kids and a lovely tropical garden setting – Bahrain's biggest water park has everything you could want from a fun-filled family day out. The new pirate ship complete with slides will be a big hit with the little ones, while the new Aqua Loop Rocket Slide will test the grown ups' nerves. 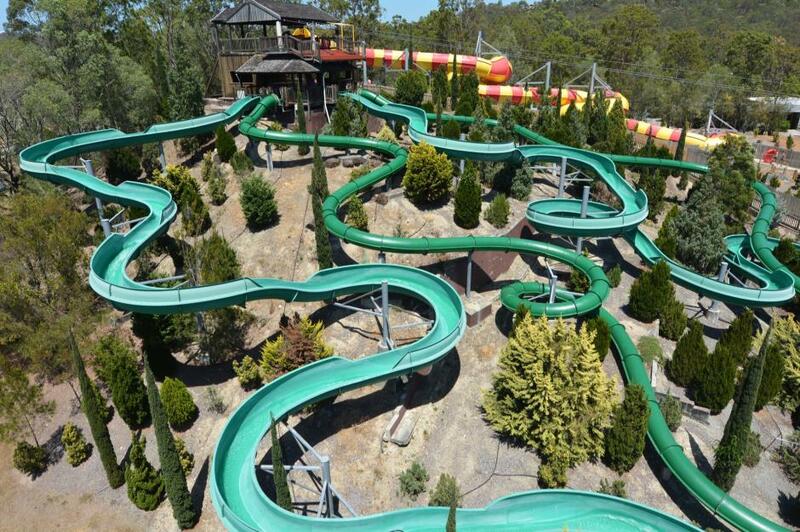 It's no surprise that balmy Queensland has Australia's best water park. Head straight to the Extreme H20 Zone if you're after a challenge. The exhilarating Blackhole takes riders on a spiral down into a pitch black tube slide. Or dare to take on the apty-named Kamikaze and plunge down a near vertical 36-foot drop for a zero gravity sensation. But there's plenty of gentler rides too and lovely tropical gardens for splashing and chilling in. Swim under the mighty Krakatau volcano, explore its trickling waterfalls and enticing lagoons or simply bob about in the waves. 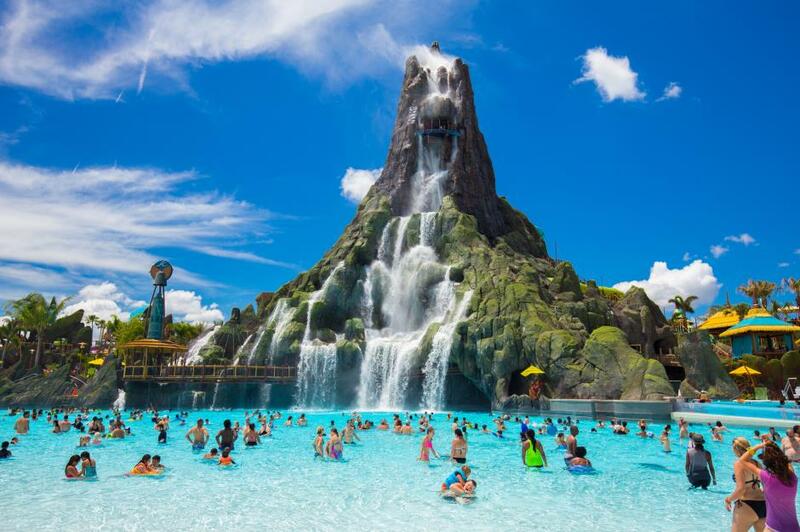 Universal Studios' brilliant new water park in Orlando is a class act. You can also experience the power of the volcano on a four-person canoe ride that twists and turns deep within the structure before plunging through a waterfall. 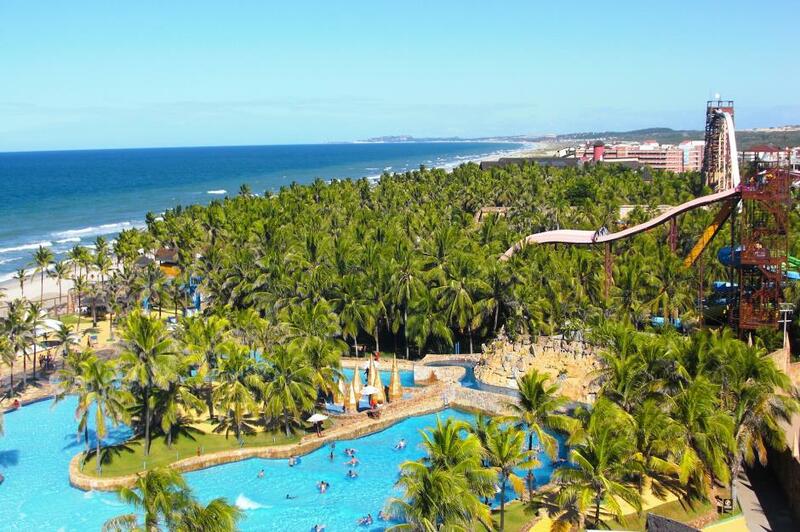 South America’s largest water park, which sits on Porto das Dunas beach near Fortaleza, is action packed. With a choice of pools, plenty of fast-paced slides and a lazy river, there's something to suit everyone. But the park is most famous for its towering waterslide Insano. It's one of the tallest in the world where riders plummet down at terrifying speeds. Keep a close eye on your companions in this fun-filled resort as it's enormous. Tropical Islands is based within a gigantic dome that used to be an airship hangar. It's so big you can even go on a free-floating balloon ride for a bird's eye view. With a rainforest area featuring over 50,000 plants, white sandy beaches and swaying palm trees, it's easy to forget you're only 40-odd-miles from Berlin. Thankfully you don't need to do it all in one day as you can stay in the resort. 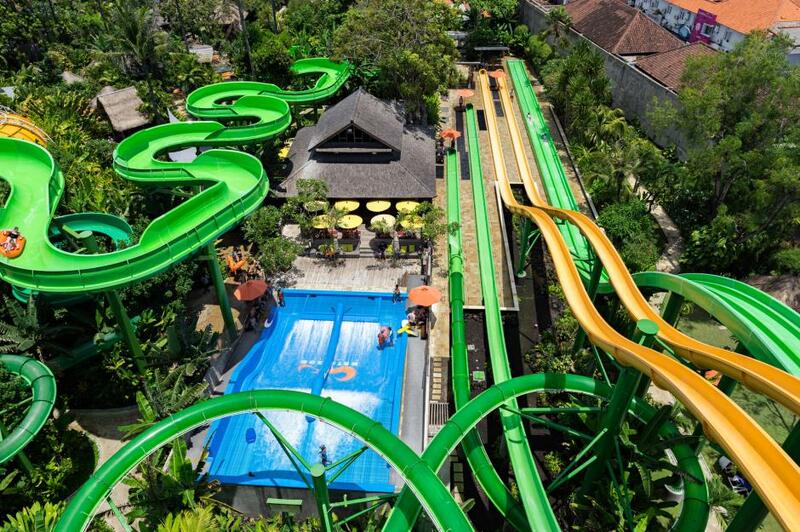 Slip, splash and scream your way around this fantastic attraction in Bali, which was named Tripadvisor's top water park in Asia and the third best in the world. Its various slides and rides are ranked from "mellow" to "extreme". The Climax (Asia's steepest slide) and Smashdown 2.0 with a sheer 85-foot drop are definitely the latter. Need to calm your nerves? There's a swim-up cocktail bar where you can sip as you gaze at the lush tropical garden surroundings. 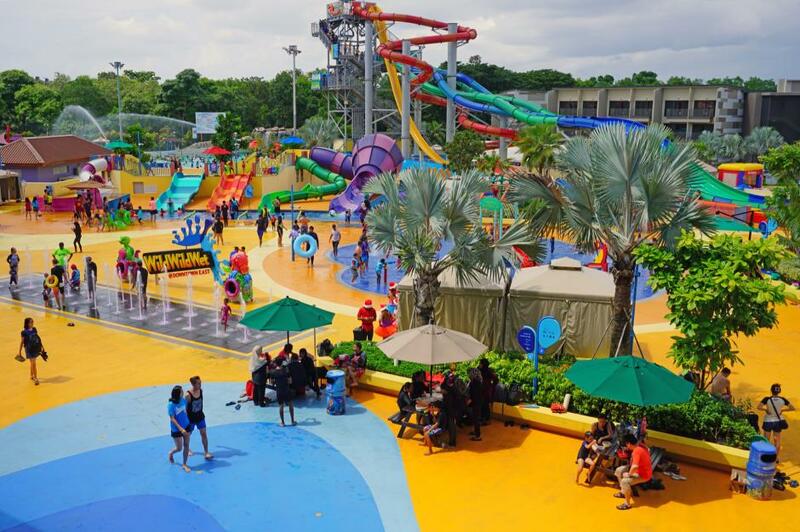 With eight adrenalin-fuelled rides and three play areas (complete with big buckets for regular drenchings and sedate slides), this water park caters for most tastes. Highlights for thrill-seekers are careering up and down giant u-shaped half-pipe on Slide Up, falling from four stories up on a 360-degree loop. Feeling competitive? Go head to head with friends as you charge down the multi-lane slide Kraken Racers. With 21 water rides and pools over an area of almost two million square feet, this attraction just south of Pattaya is big. In fact, it's Thailand's biggest water park. But it's also very beautiful with lovely green spaces and a natural lake. The double wave pool guarantees plenty of squeals as do the Aqualoop and Freefall – the park's most extreme rides. Small children are also well catered for with play areas and the lovely lazy river. 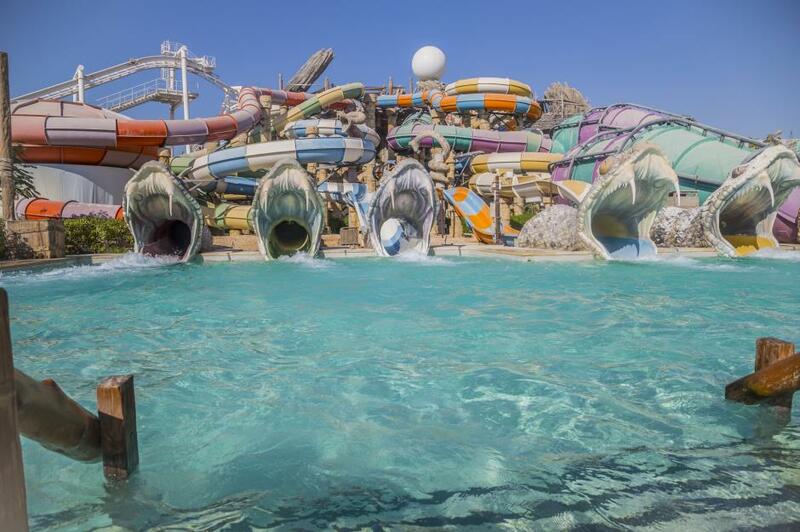 Daredevils will love Abu Dhabi's vast water-filled attraction, which has no less than 41 rides. 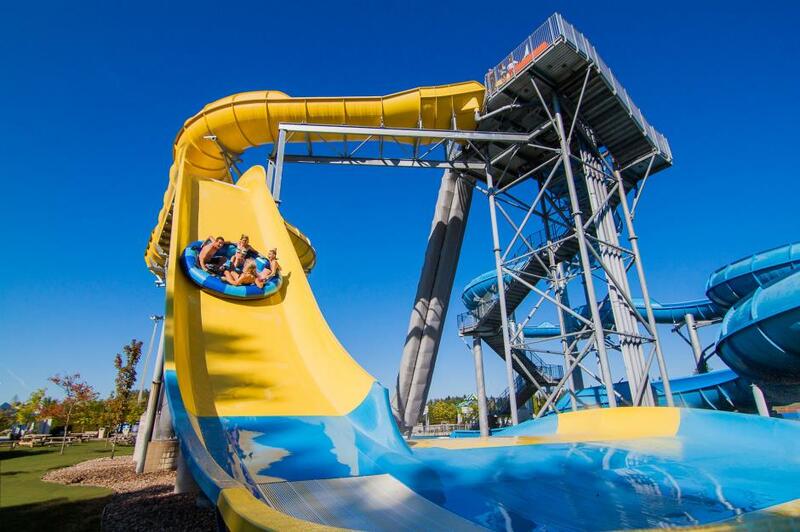 Try the near-vertical slide Jebel Drop or gather your mates to try the world's first and largest hydromagnetic-powered six-person tornado waterslide. At over 770-feet-long, the thrills will keep on coming at you. Another highlight is Bubble's Barrel where you can ride 10-foot-high waves on the world's largest surfable sheet wave. Or take a spin above it all on rollercoaster The Bandit Bomber. 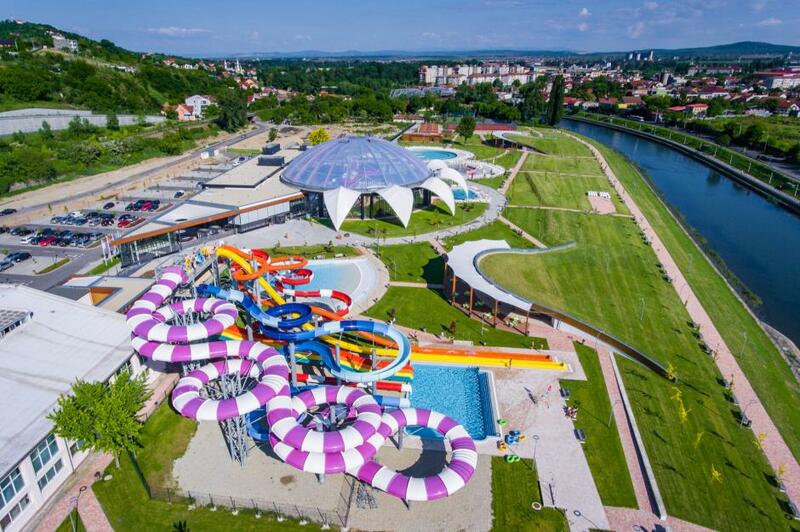 Whether you're leaping about in the wave pool, doing lengths in the Olympic-sized pool, whizzing down waterslides or walking the plank on the pirate ship, Romania's top water park is sure to delight all the family. Parents can take it in turns to kickback in the spa which has a Turkish bath, a range of geothermal water pools, steam room, sauna and cold room. Antalya's fairytale and legend themed attraction makes for a super-fun family excursion. It's especially magical for children with its aqua discos and entertaining shows. 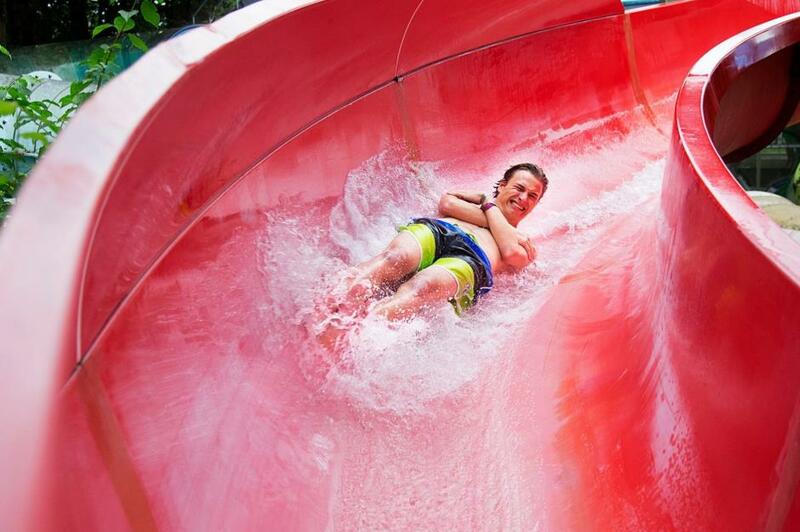 But there's plenty of fun for thrill-seekers too with numerous slides and raft rides. Or go for a spin above ground on the 140-foot-high Typhoon Coaster, which ends with a triumphant splash. 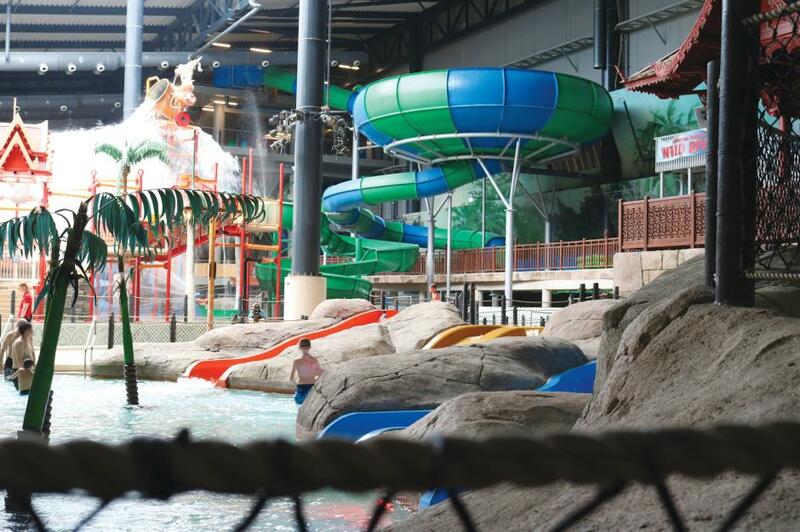 You can take on the tallest waterslide in North America and go for a swim in Canada's largest wave pool at this record-setting park in capital Ottawa. 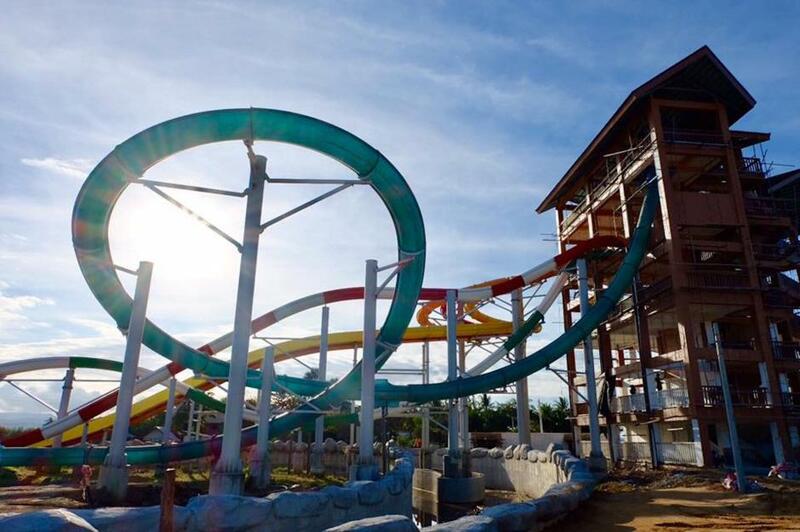 Other highlights are twisting and turning down the 360-degree loops on the Turbulence waterslide, plunging into a dark tunnel on a six-person raft on Boomerango and completing the floating obstacle course by crossing inflatable logs, crocodiles and water lilies. Set in Pfaeffikon within the Canton of Schwyz, Alpamare stakes its claim as Europe's biggest covered water park, although it does have some outdoor heated pools too. Test out some of the 11 fun and themed waterslides – Iceexpress promises a chilly surprise while Tornado comes complete with light and sound effects. Then go for a rejuvenating soak in the salt bath that's heated to a blissful 36°C. Drift down the 1,300-foot-long Lazy River ride that meanders around the park on a giant raft, go for a massage or get your blood pumping on the Extreme Black Hole Slides. 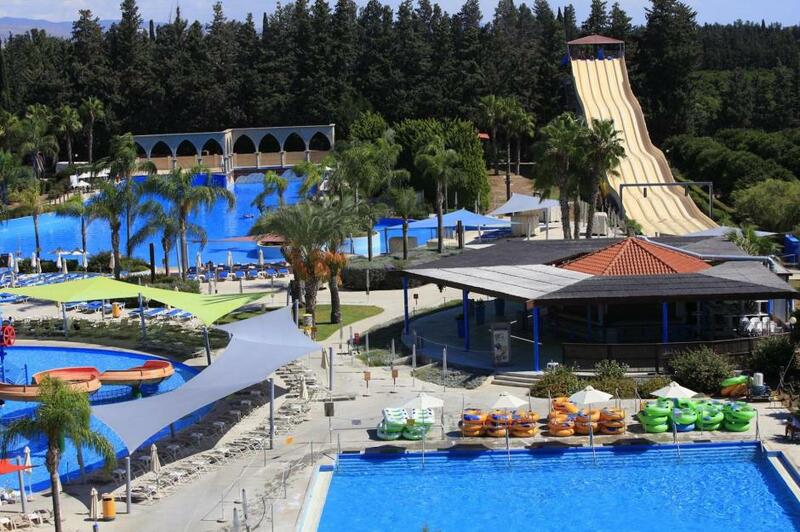 Family favourite Cyprus has some fantastic water parks, but this Polynesia-themed attraction in Limassol is definitely one of the most impressive. Slightly different to your average water park, this attraction in Rutland lays claim to being the UK's largest inflatable water park. And it all looks like serious fun. 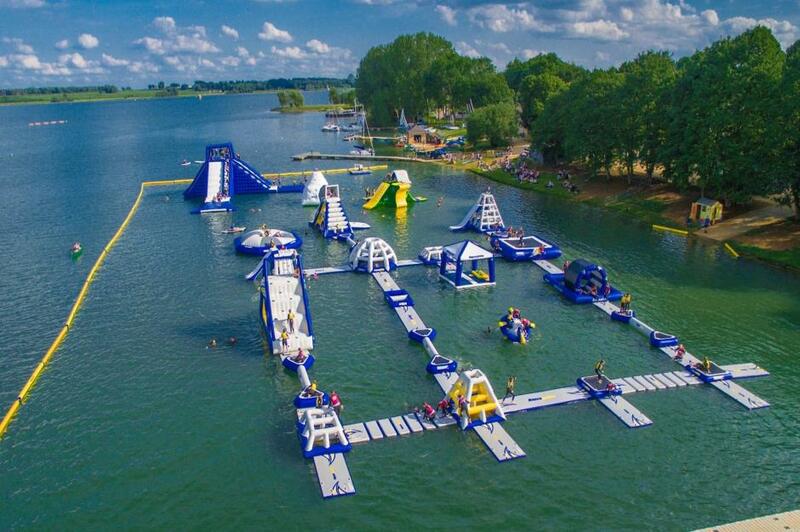 Set on the north shore of Rutland Water Park, the 330-foot by 260-foot inflatable course includes climbing walls, trampolines, balance bars, rockers, rollers, blast bags, and slides. Do you dare take on the challenge? 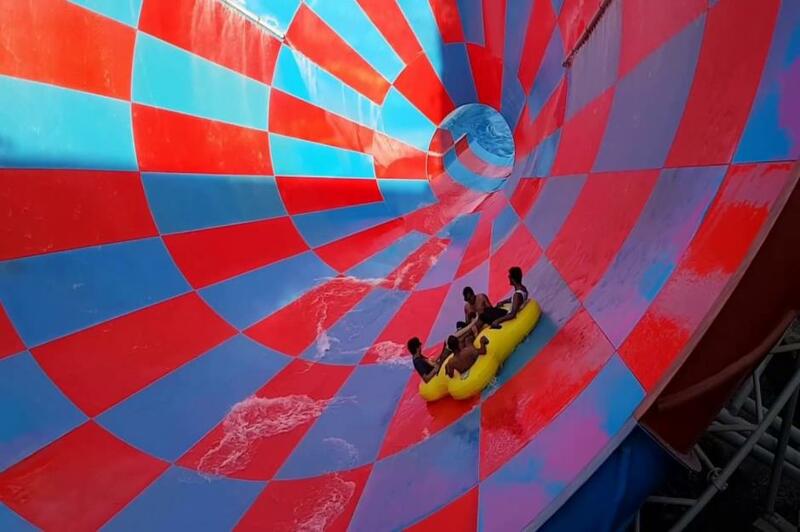 Whoosh down a giant cone-shaped slide on an inflatable raft, feel the Earth disappear beneath your feet on the terrifying Plank Drop Slide and go for a spin on the speedy Pira-Chute. The Pirate-themed park promises plenty of thrills and spills as well as lovely chill-out zones. Shimmy up the crows nest, also known as the Jolly Roger CombiTower, to get your bearings with its fantastic views over the park. 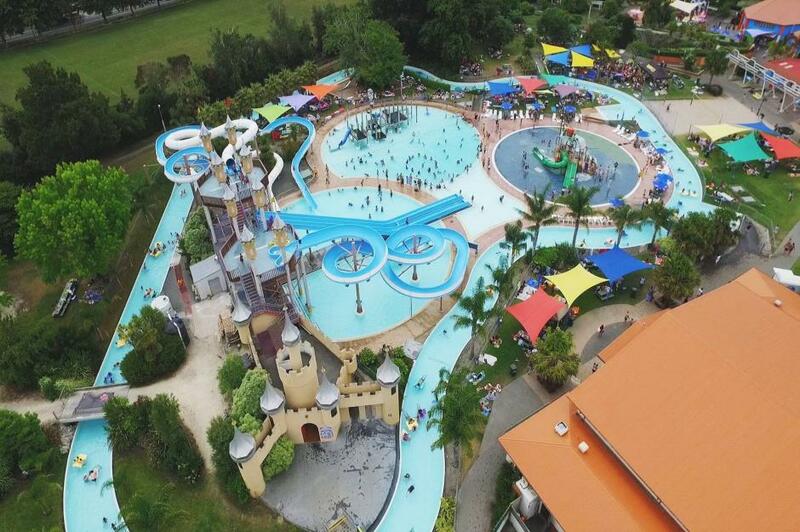 As you'd expect from an outdoor-sports-loving nation like New Zealand this water park on the North Island's east coast offers extreme fun. Test your mettle on the high-adrenaline slides, go kayaking around a lake, do battle on the bumper boats or hurl yourself around the inflatable obstacle course. Beware though, little ones will want to maroon themselves forever on Toddler Island. Experience the sensation of being sucked into a tornado, race friends down a series of multi-coloured slides or get a moment of weightlessness as you shoot up the near-vertical wall of a half pipe on a raft. 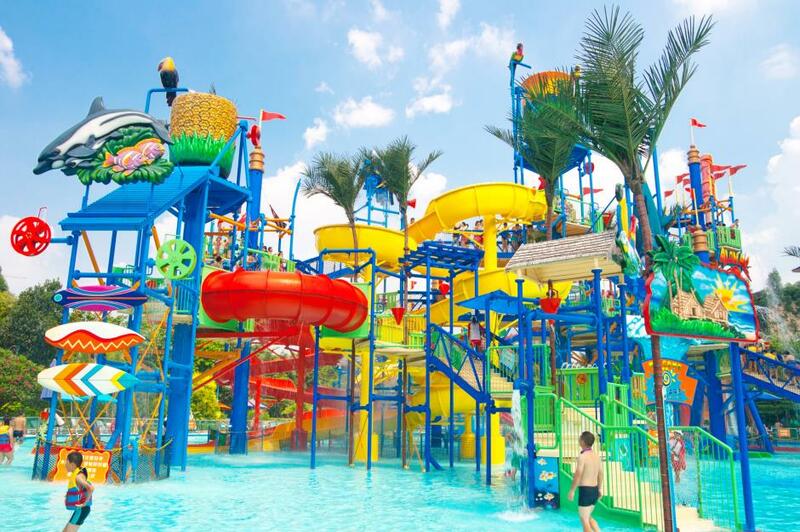 Based in Guangzhou China, this enormous attraction has everything you could hope for from a water park: thrilling rides and slides, kids play areas, plenty of pools, waves and a lazy river. 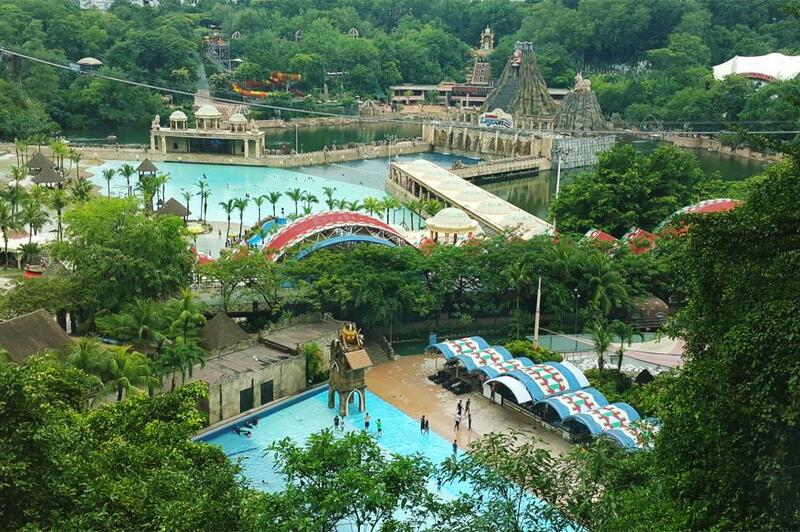 In addition to various scream-fest water rides, there's an enormous man-made surf beach in the water area of this mega multi-theme park not far from Kuala Lumpur. After you've leapt about in the waves and taken a turn in the rapids of the mighty Zambezi river dare to take on the Vuvuzela. It's the park's most thrilling slide and Malaysia's largest. Have the kids seen one too many Roman ruins or reached peak cathedral? Take them to this watery wonderland in Emila-Romagna and their spirits will soon lift. 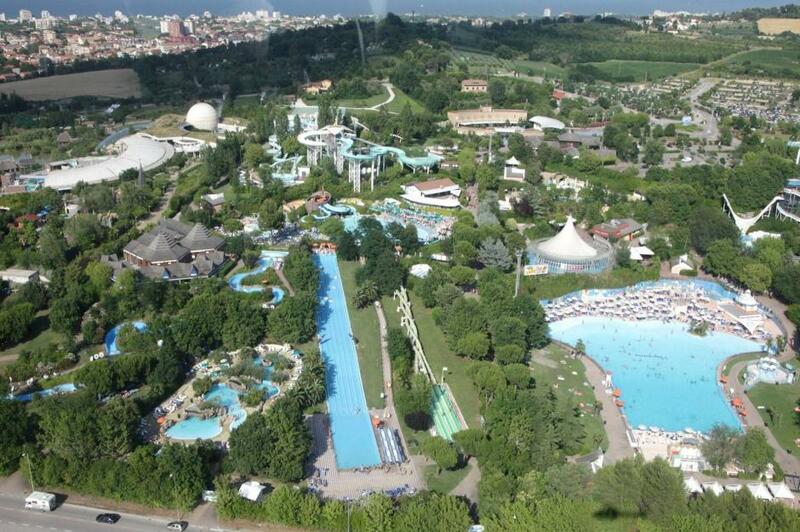 As one of Europe's largest water parks it has a host of attractions including a great selection of waterslides, lazy river, rapids, a wave pool and special pools for babies and small children. Although, it can get lively in the holiday season with loud music and the odd foam party. 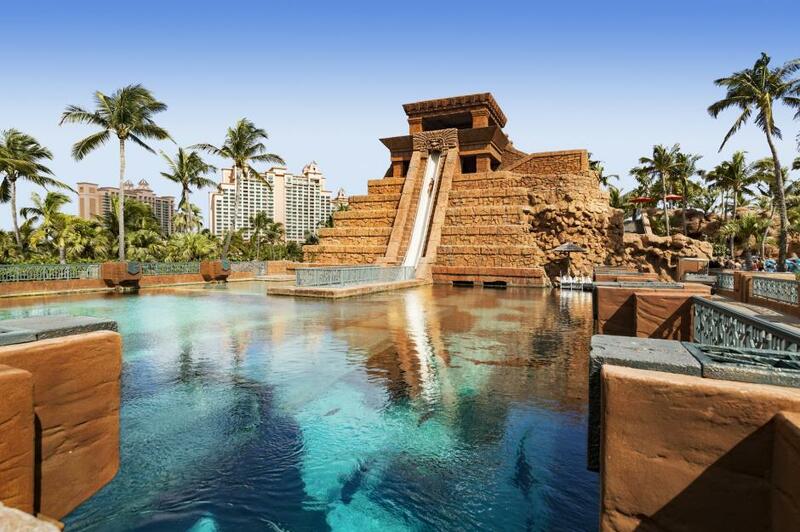 Designed with a Maya civilisation theme, Aquaventure Waterpark is surrounded by tropical greenery and part of the Atlantis, Paradise Island. Launch yourself from the top of Mayan Temple on the Leap of Faith to drop down a near vertical clear tunnel at high speed, shooting through a shark-filled tank. Or twist and turn around the temple's dark core on the Serpent Slide. 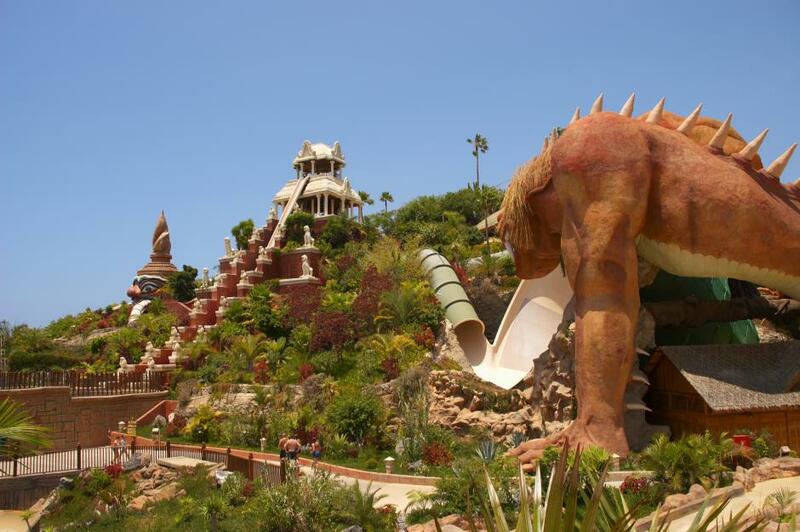 The sedate Jungle Slide takes children on a watery safari through jungles and caves. They'll also love firing the water cannons in the play fort. Hold onto your swimsuits as you hurtle down the Ouragan water slide, which sends you along 260-feet in just seven seconds. You can check your speed on the timer at the end of the course. Or turn yourself into a human cannonball on the Cannon Ball slide. 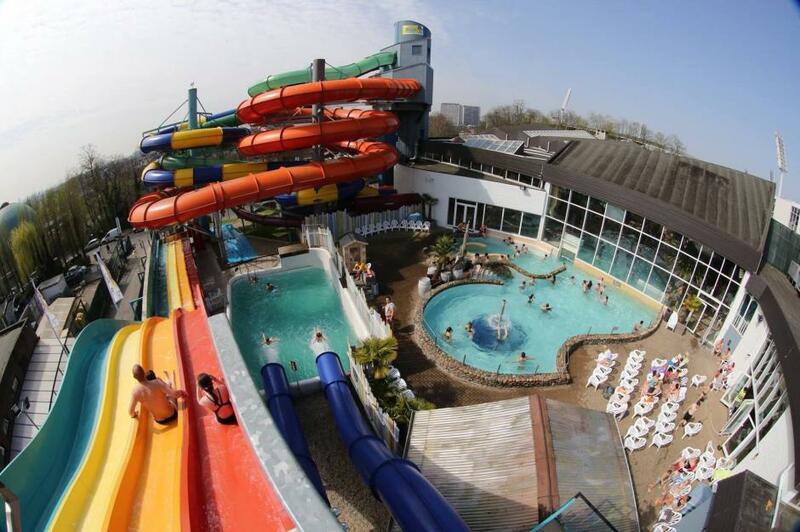 Belgium's biggest water park is fantastic fun, with a choice of indoor and outdoor pools as well as a chill-out spa area. There are bucketfuls of fun for the whole family at Imagica's water-based theme park from playing pirates in Pirate Bay or drifting idly down the lazy river to navigating the steep falls on thrilling family raft ride Soakerz. For lovers of high-speed slides though it has to be the Loopy Woopy, Swirl Whirl or Yello-O. You'll definitely be yelping with delight after a day at the Mykonos-themed park in Khopoli, which is around an hour south of Mumbai. 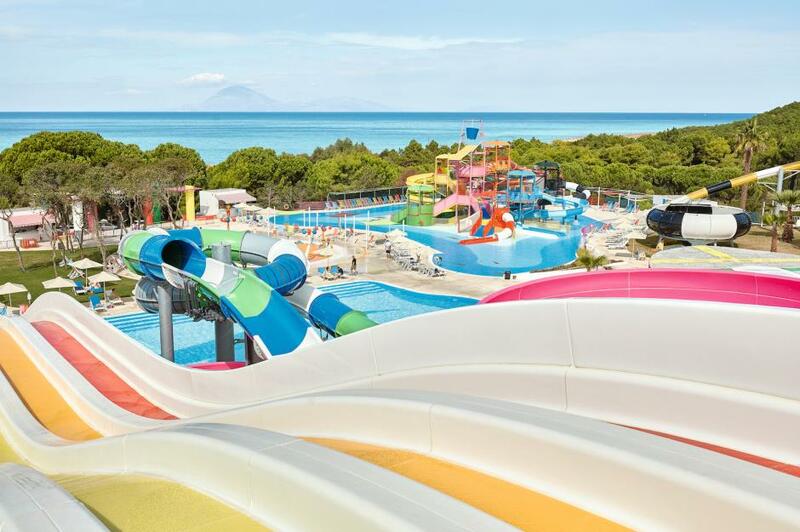 Water fun gets taken up a gear at this new park in the Peloponnese that's perfect for thrill-seekers. Aside from a whole host of waterslides, you can test your mettle on rides such the Looping Rocket where you'll be blasted 65 feet into the sky from a launch capsule. Take the plunge down the high-speed Space Ride or drop into the darkness of the Black Hole. There's also a Greek gods-inspired children's play area.